You can also perform a more selective search for churches in the Irby in the Marsh area or see them printed on a map. The church is built of sandstone and brick and was restored in 1863, then partially rebuilt in 1886. The church only seats about 95 people. A photograph of the Anglican church is at the Wendy PARKINSON English Church Photographs site. Rodney BURTON has a photograph of All Saints Church on geo-graph, taken in March, 2004. The Anglican parish register dates from 1539. 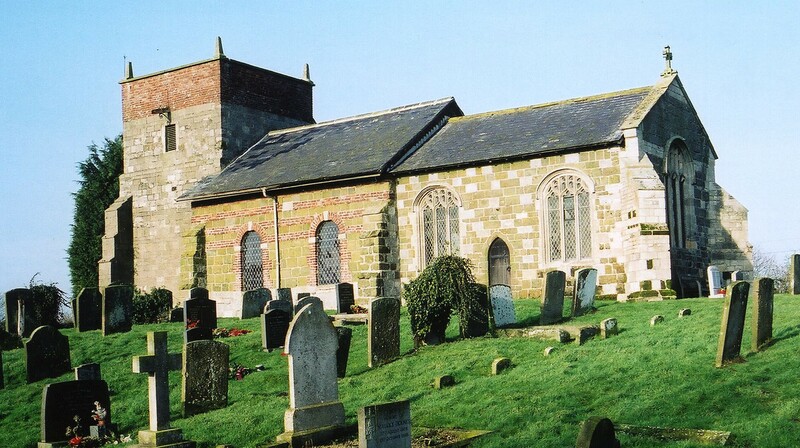 The Lincolnshire FHS has published several marriage indexes and a burial index for the Calcewaith & Candleshoe Deanery to make your search easier. A Primitive Methodist chapel was built here in 1837 and Wesleyan Methodist chapel was built here in 1889. David HITCHBORNE has a photograph of a portion of the Wesleyan Methodist chapel on geo-graph, taken in June, 2007. For information and assistance in researching Methodist chapels, see our non-conformist religions page. This village and small parish are 125 miles north of London and 5 miles east south-east of Spilsby. Firsby parish lies to the west and Bratoft parish to the east. The parish only covers about 770 acres. By automobile, take the B1195 arterial road east out of Spilsby toward Wainfleet for about 5 miles. Ask for a calculation of the distance from Irby in the Marsh to another place. You can see the administrative areas in which Irby in the Marsh has been placed at times in the past. Select one to see a link to a map of that particular area. In March, 1888, this Civil Parish gained a portion of Firsby Civil Parish, but it lost over 300 acres in parish boundary changes. You can contact the local Joint Parish Council about civic or political issues, but they are NOT staffed to answer family history questions. The Joint Council includes Bratoft, Firsby, Great Steeping, Irby in the Marsh and Little Steeping. Kelly's 1900 Directory of Lincolnshire places the parish in the South Lindsey division of the county. In 1503 John HOLDEN left by will 54 acres of land to let for charitable purposes. After the 1834 Poor Law Amendment Act reforms, the parish became part of the Spilsby Poor Law Union. The first school was built here in 1844, funded by Holden's Charity. A School Board was formed in the parish on 10 March 1876 and the district included Firsby, Bratoft and Irby in the Marsh. A Board School was built in 1880 to hold up to 100 children.